THINKING OF DOING BUSINESS IN ASIA? 1. China is hard to crack.. Be realistic. You can sell in China, but you certainly won't make a mark without being 'in' China. A solid JV, or number of JVs is still the best way to operate, and over time the number of sharks out there who’ll take advantage of dumb and greedy western brands is diminishing. But they still exist - so choose your JV partner wisely, and start small. Operate, learn, improve. Repeat. 3. Size. Check out the graphic below to understand the potential of China. 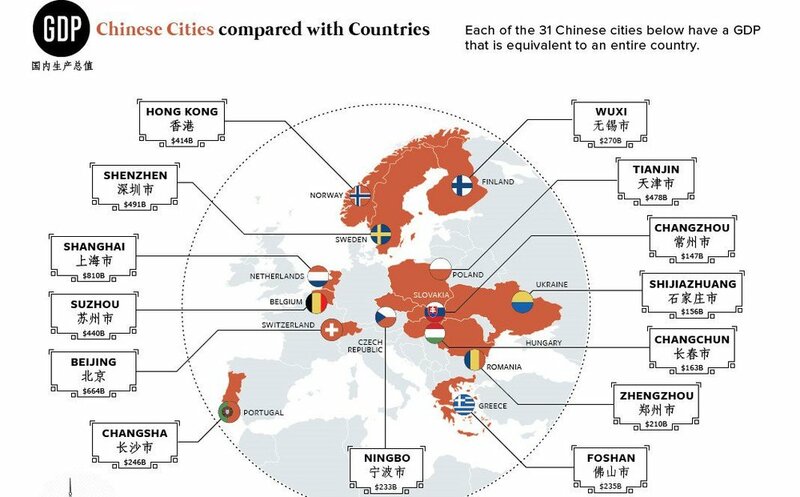 It's not just Shanghai, Guangzhou and Beijing that you need to be aware of, its places you may never have heard of, but that are already bigger in GDP terms than European countries. Potential still exists to grow, if you can get into China. 4. Hong Kong is figuring out what it stands for in the world today. It’s still ‘a’ gateway to China but no longer ‘the only’ gateway. So what does a very small island do next to retain its people, culture and business identity...no-one really knows, but the sharing economy is booming, as is fintech and e-commerce, so watch those spaces. 7. Japan - is on the international brand map and always will be, it’s hugely sophisticated and now has everything from manufacturing to innovation going for it . A good chunk of the global sporting events is focussed around Japan in the coming years...Rugby World Cup 2019, Tokyo 2020 Summer Olympics to name two. It’s world-leading brands never went away but expect them to ‘up the ante’ internationally in the coming 12 months as they use sports marketing to be relevant to you and I through our passion points again. 8. Winter sports - China is awakening to winter sports and how it can leverage its natural resources. Japan, Korea and ANZ have always had winter sports but now China is coming, the next wave of democratisation of winter Sports isn't far away. There are 700 ski resorts in China and 1.2 million skiers already. Club Med has resorts in China and it’s home to the world largest indoor ski slope - who’ll be the first Chinese equipment or clothing brand to make it onto your radar? YAOHUI ski goggles or QIQIHAR Black Dragon Skates? You heard the brand names here first. 9. Sport is not the only entertainment - music, TV and cinema remain big draws globally, and bigger than traditional sport in Asia. Add in esports and there is some serious competition for brand’s marketing dollars. Fragmentation is good for targeting specific ‘tribes’ so micro-targeting will continue at pace. However everything in marketing is cyclical, and I expect to see brands try to do both niche activity as well as large scale partnerships to deliver brand growth - this works, 'if' activation dollars support. Unfortunately in Asia this is often where the equation breaks down, with no leverage of assets. 10. Diversity and Inclusion - Looking into Asia, it could feel like Asia is behind in DI. In fact it’s not - it’s progressive in places and behind the curve in others, as DI is such a broad topic. Thailand’s culture embraces gender ambiguity and freedom to change ahead of any other culture worldwide. A-Sam (a World Surf League rider) recently became the first openly gay Chinese ambassador for the Federation of Gay Games. But on the other hand Mr Gay World has just been cancelled in Hong Kong as Chinese authorities clamped down on the organiser who was based on the mainland, instructing then to stop promoting homosexuality. Regardless of specifics, from gender pay equality to LGBTQ rights, Asia is fast embracing Diversity and Inclusion, and that’s great culturally and for business and brands.